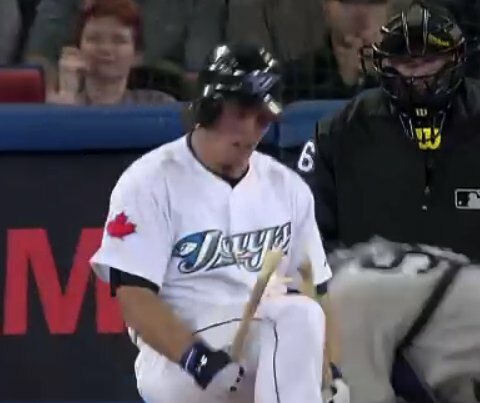 Snider channeled this anger into the game-winning hit. 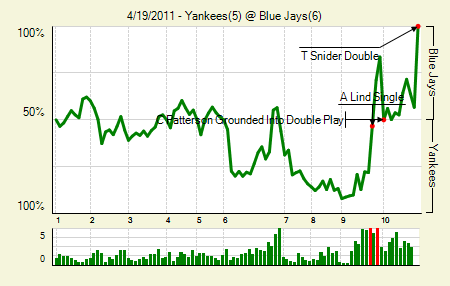 Moving the Needle: Travis Snider walks off with a double int the gap, +.433 WPA. It doesn’t happen often, but it happened last night. Mariano Rivera blew a two-run lead in the ninth — and was lucky to escape a bases-loaded, one out jam with the winning run on third. But the Jays came back the next inning and knocked around Ivan Nova a bit. Snider’s double scored Edwin Encarnacion all the way from first, giving the Jays a much-needed win. Jose Bautista: 1 fot 3, 1 HR, 2 BB. His homer opened the scoring, and his ninth-inning run, on a John McDonald bunt, tied the game at five. Curtis Granderson: 2 for 5, 1 HR. Continues to have as many homers as singles (5). Eight of his 13 hits have gone for extra bases. 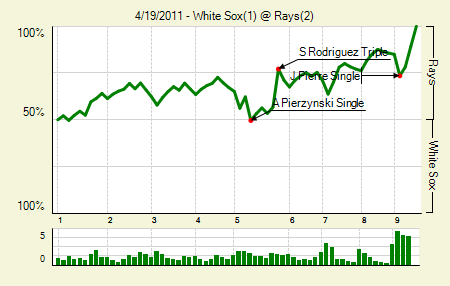 Moving the Needle: Sean Rodriguez triples home the go-ahead run, +.204 WPA. There’s nothing better than a pitchers’ duel. Not only do you see two guys showing off their stuff, but you also get that single moment when one of the offenses takes the game. That moment came in the fifth for the Rays. With a runner on first and one out Rodriguez lined one into the alley in right-center, chasing Alex Rios all the way to the wall. The runner came around to score easily, and Rodriguez dived into third just ahead of the throw. They couldn’t score Rodriguez — it was, after all, a pitchers’ duel — but that was enough to win the game for the Rays. James Shields: 9 IP, 4 H, 1 R, 1 ER, 1 BB, 9 K. After just four strikeouts in his previous 13 innings, this was refreshing. Here’s an interesting tidbit from Richard Justice: For the past 618 games, the Rays have started a pitcher age 29 or younger. Shields turns 30 in December. John Danks: 7 IP, 7 H, 2 R, 2 ER, 0 BB, 5 K. Worked into and out of some trouble in the early goings, but he generally kept the Rays in check. This is the first game this season in which he hasn’t allowed a home run. Ben Zobrist: 2 for 4, 1 3B. He scored both of the Rays’ runs. 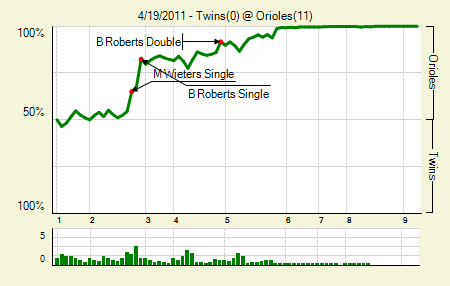 Moving the Needle: Brian Roberts knocks in a pair with a bases-loaded single, +.147 WPA. So many run scoring hits for the Orioles in this one. Which one to choose? How about the one that put them up 3-0 in the second? With two outs and the bases loaded, Roberts hit one that got by Matt Tolbert at second, but died soon after it hit the outfield grass, making it easy for two runs to score. The Orioles would tag Carl Pavano for four more runs before he finally exited the game. After the shutout the Twins have scored just 50 runs in 17 games. Matt Wieters: 2 for 3, 1 2B, 1 HBP. He scored three runs and drove in four. Moving the Needle: Ryan Braun takes one out to the opposite field, +.111 WPA. It was not a banner day for Roy Halladay, who allowed six runs through 6.2 innings. 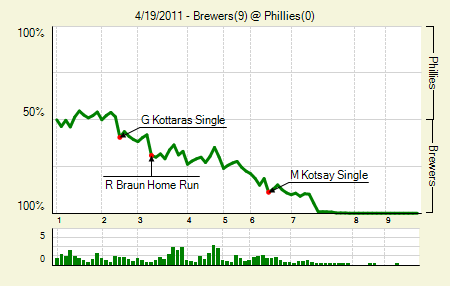 George Kottaras got things started with an RBI single in the second, which was just 0.1% less valuable than Braun’s homer, which came in the third, and it gave the Brewers a 2-0 lead. Halladay would settle down in the middle innings, getting seven in a row between the third and the fifth, but the Brewers brought some runners around in both the sixth and the seventh. Prince Fielder: 3 for 4, 1 BB. Only the sixth walk of the season for Fielder. But he’s now hitting .338, so that takes care of that a bit. Randy Wolf: 6 IP, 2 H, 0 R, 3 BB, 5 K. Six innings, three walks? Meh. Notable because Wolf has now struck out 25 batters in 22.2 innings. 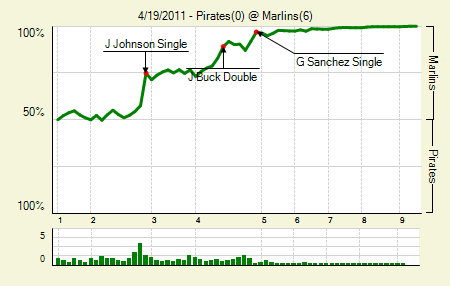 Moving the Needle: Josh Johnson gets himself all the runs he’ll need, +.174 WPA. When JJ is on the mound, he doesn’t need much run support. Last night he needed only the runs he himself drove in. His opportunity came in the second, when he came to the plate with the bases loaded and two outs. His liner went over Neil Walker’s head and gave the Marlins a 2-0 lead. Josh Johnson: 7 IP, 2 H, 0 R, 1 BB, 9 K. Ho hum. John Buck: 2 for 4, 1 2B. It’s been a rough start for Buck in Florida, but if you have just 13 hits at this point, it’s good, at least, that six of them have been for extra bases. Moving the Needle: J. R. Towles doubles the ‘Stros score with a double, +.126 WPA. With a runner on first and a one-run lead in the fourth, Towles hit a prototypical gap double. But only at Citi Field can the protypical turn inot an odd occurrences. This time it was Brett Wallace, who is shaped like a pear, scoring from first base. As I always like to say, don’t forget to bring a Towles. Wandy Rodriguez: 7 IP, 3 H, 1 R, 1 ER, 3 BB, 7 K, 1 HR. 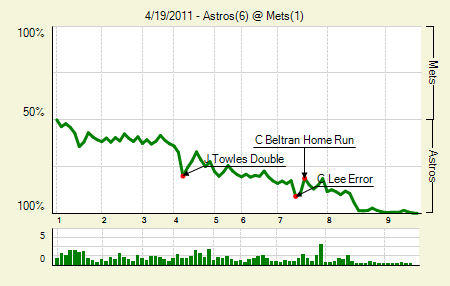 If your only damage is a solo homer to Carlos Beltran, it was a good start. That’ll help correct his 7.31 ERA heading into the game. 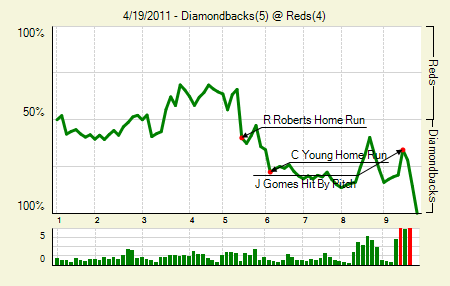 Moving the Needle: Ryan Roberts puts the DBacks up by a run with a homer, +.259 WPA. Heading into the fifth the Reds held a 3-2 lead, but Sam LeCure would let it slip away in the next two innings. His first, and costliest, mistake came on a first-pitch fastball to Roberts, who pulled it over the fence in left-center to give the Diamondbacks the lead. They would tack on another in the sixth, an insurance run they’d end up needing. It was Roberts’s second homer of the game. Kelly Johnson: 2 for 5, 1 HR. He really needed that one, as his start to 2011 is pretty much the opposite of his start to 2010. Joey Votto: 0 for 3, 1 HBP. The hit by pitch kept his on-base streak alive. It has lasted all season. Moving the Needle: Carlos Santana strikes out looking to end it, -.234 WPA. Joakim Soria almost blew this one. A Wilson Betemit error to open the inning didn’t help, but a single, hit by pitch, and a walk loaded the bases. Another walk brought the Indians to within one with Santana coming to the plate. But he got in a quick 0-2 hole and ended up looking at strike three. Bruce Chen: 7 IP, 6 H, 2 R, 2 ER, 3 BB, 5 K, 0 HR. It’s hard to ignore a good Chen start, even if he did walk three. He had walked only four in his previous three starts. Alex Gordon: 2 for 4, 1 2B. And the hot start continues. Moving the Needle: Mark Trumbo breaks the tie with a homer, +.205 WPA. This was actually a game after three, with the scored tied at one. But in the fourth Trumbo came back to homer off Colby Lewis, putting the Rangers up 3-1. 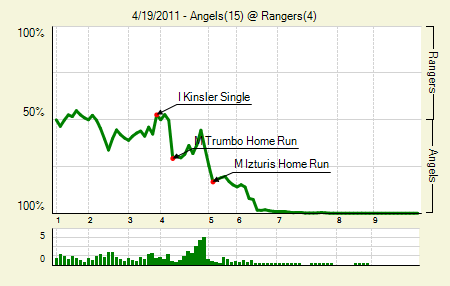 Trumbo drove in the Angels’ first run, and then drove in another in the sixth. That’s two games in this series, and two complete blowouts. Peter Bourjos: 4 for 5, 1 2B, 1 HR. It’s been a slow start for Bourjos, but his evening brought him up to .293/.362/.500 (from .245/.293/.396). If he goes 0 for 4 tomorrow that’s .274/.323/.468. Love the early season fluctuations. Alberto Callaspo: 2 for 3, 2 BB. Scored all four times he came to the plate. 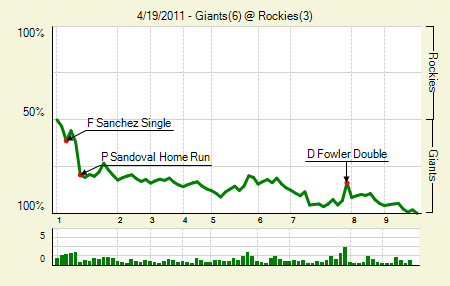 Moving the Needle: Pablo Sandoval sends a ball into the Rocky Mountain air, +.176 WPA. After dominating the Rockies on Monday, the Giants got back to the task on Tuesday, racking up four runs in the first inning. The decisive moment came when Pablo Sandoval laid into one and nearly cleared the bullpen in right-center, which is to say, a long way. To be more precise, 441 feet. Honestly, I was hoping it was Aubrey Huff who hit the high WPA homer (he did hit one, but later in the game) so he could join the commenters in ridiculing my latest post. Ubaldo Jimenez: 5 IP, 6 H,4 R, 4 ER, 2 BB, 6 K, 1 HR. Only his second start of the year, this one went quite a bit better than the first. He didn’t allow any runs after the Sandoval homer, and he actually missed bats this time. He even got swings and misses when it counted — that is, when he had two on and none out in the fifth. It was an early exit thanks to his pitch count running up, but this one can be considered an improvement. Freddy Sanchez: 2 for 5. OK, so Sandoval and Huff were the real standouts, but I don’t like using guys from the Moving the Needle section in the Notables section (with a few exceptions for situations like Josh Johnson’s above). But I also didn’t want to leave the Giants out of the section completely, since they had this game well at hand from the beginning. 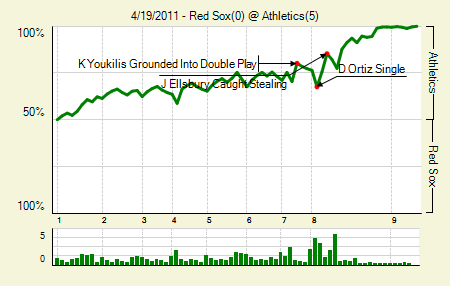 Moving the Needle: Darnell McDonald ends the Red Sox best comeback chance, -.102 WPA. As we see from time to time, this is a game where the final score doesn’t really reflect the closeness of the game. The A’s got on the board in the first with a single, stolen base, and two ground outs. Then the sides were scoreless through seven and a half. The Red Sox had just one instance of a man in scoring position before the 9th, which came with two outs in the eighth after Jarrod Saltalamacchia singled. But it was good morning, good afternoon, and good night for McDonald, who, after taking the first two for strikes, swung over a slider in the dirt to end the threat. The A’s would tack on their runs in the bottom half of the inning. Mark Ellis: 1 for 3, 1 BB. Notable, because he was the only A’s hitter to reach base twice in the game. Each of the other eight reached base exactly once. Brett Anderson : 8 IP, 4 H, 0 R, 1 BB, 8 K. A healthy Anderson is one reason why many people picked the A’s to win the West. He and Cahill are turning into quite the 1-2 punch. Moving the Needle: Ryan Raburn lines into a double play, -.120 WPA. I guess this is one of those quirky WPA things that occur when a team is up big. We know that when teams take early leads that the needle doesn’t move too far. In this one, the Tigers had a 4-0 lead in the second when Ryan Raburn lined into a twin killing that removed a runner from scoring position. 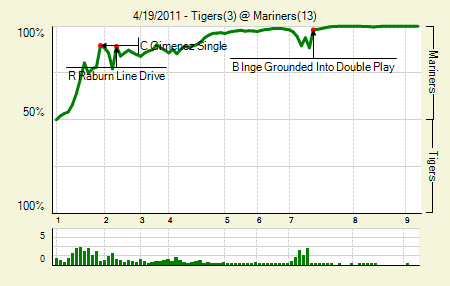 Odd that it caused that much of a swing, considering the score, but I guess that was a critical point for the Tigers while they were down. The highest positive, +.115, came in the first, when Chris Gimenez singled home a pair to open up the aforementioned 4-0 lead. This game was all Mariners. By the way: the easy joke for the past year has been the Mariners’ ineptitude on offense, but with that 13-run outburst they’re now 18th in the league in runs scored. For temporary comparison’s sake, the Red Sox are 20th. Ichiro: 4 for 5, 1 BB. Mr. 80 Hit Tool is back at it again. Took his average from .250 to .286 with this game. Chone Figgins, Jack Cust, and Michael Saunders: The only Mariners with extra base hits, all doubles. Seriously, that’s 13 runs on 3 extra base hits. Singles and walks. Lots of singles and walks. Moving the Needle: Martin Prado breaks the scoreless tie, +.174 WPA. No, that line is not sarcastic. The first five innings of this game passed without a run crossing the plate. 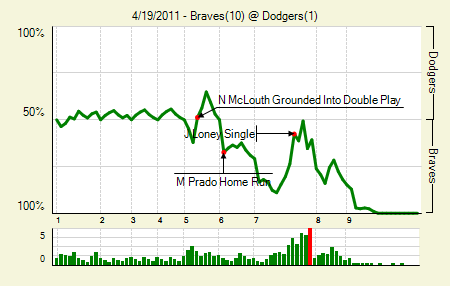 It wasn’t until the sixth that the Braves broke through. Even then, it was just a solo shot off Hiroki Kuroda to give them a 1-0 lead. This was actually a 2-1 game heading into the ninth, but the Dodgers ran into that problem where they have had trouble finding a guy in the bullpen capable of recording three outs. Brandon Beachy: 6 IP, 2 H, 0 R, 2 BB, 7 K. The only downside is that it took him 111 pitches to complete six. Otherwise, a marvelous job by Beachy. We hoped you liked reading The Morning After: Game Recaps for April 19th by Joe Pawlikowski! Anderson looked like the Ace he is. If he can stay healthy, the A’s are lookin’ good.